Attention parents of college students across America. Apparently, your children may not be safe. This isn't a warning about real physical dangers on campus, from sexual assault to random shootings. Rather, some advocacy groups say college students are at risk – maybe you'd better sit down for this – of being exposed to ideas and opinions they may not like. It's getting so bad that this week, the Council on American-Islamic Relations (CAIR) New York chapter demanded that Brooklyn College "take measures to ensure the safety of Muslim and Arab-American students" because of an upcoming speech by a harsh critic of Islam. Pamela Geller, who has posted bus ads comparing Islamic terrorists to savages, is a polarizing figure. But her speech will be just that – a speech at a college campus. Not too long ago, such places encouraged students to "think the unthinkable, discuss the unmentionable, and challenge the unchallengeable." Now, they are increasingly being called on to sanitize debate to protect the delicate sensitivities of young adult minds. Rather than encourage students to either skip the event entirely, or to attend and challenge Geller with questions, CAIR opted to scare students, and by extension, their parents, by darkly hinting the talk would lead to violence. It is baseless. Yet, this is no isolated incident. In Time magazine, journalist Asra Nomani described efforts to stop her from speaking last week at Duke University. She planned to "argue for a progressive, feminist interpretation of Islam in the world," but that apparently was unacceptable to some on the prestigious college campus. The university initially cancelled the speech, she wrote, "after the president of the Duke chapter of the Muslim Students Association sent an email to Muslim students about my 'views' and me, alleging that I have a nefarious 'alliance' with 'Islamophobic speakers.'" We don't like her. We don't like people who might agree with her, the MSA, a group created by the Muslim Brotherhood in the United States, said. Ban her. Thankfully, Duke reversed its decision and promised it is "strongly committed to free expression and open discussion of controversial issues." But the message to young Muslims was clear. Her words and ideas about modernizing her faith are a threat. Stay away. Worse yet, the fuel for the students' protest came from a Duke professor, Omid Safi, a leader of the University's Islamic Center, who previously accused Nomani, a Muslim, of "enabling Islamophobia," a contrived term used by radical Islamist groups, as Nomani noted in a January Washington Post column, to intimidate people out of discussing or criticizing radical Islam. Only nine people attended Nomani's talk, a third of them were her immediate family members. Writing more in disappointment than anger, Nomani said the incident exposes the need to have "a broader debate over how too many Muslims are responding to critical conversations on Islam with snubs, boycotts, and calls for censorship, exploiting feelings of conflict avoidance and political correctness to stifle debate. As a journalist for 30 years, I believe we must stand up for America's principles of free speech and have critical conversations, especially if they make people feel uncomfortable." That's not likely to happen anytime soon. As Nomani wondered whether she would get to speak at Duke University, separate campaigns sought to cancel on-campus screenings of the film "American Sniper" at Michigan and Rensselaer Polytechnic Institute. Michigan initially scrubbed the screening of the film profiling U.S. Navy SEAL Chris Kyle. But the university reversed itself in the face of a mounting campus backlash that grew national. The film will be re-scheduled to include a panel discussion. "The urge to excise any sort of negative energy, thought, or feeling in and out of classrooms on campuses is widely and appallingly documented," wrote Nick Gillespie, editor of the Libertarian-minded Reason website, before Michigan rescheduled the film. "But this latest petty capitulation on the part of feckless administrators to student demands for the ideological bubble-wrapping of education makes some of us remember when college was supposed to be a place to have conversations not stop them before they begin." These are all relatively small events – a speech in a campus hall, a film screening – that students can choose to attend or skip depending on their interests. There is no need for a heckler's veto deciding for others what is an acceptable topic or who represents an acceptable speaker. 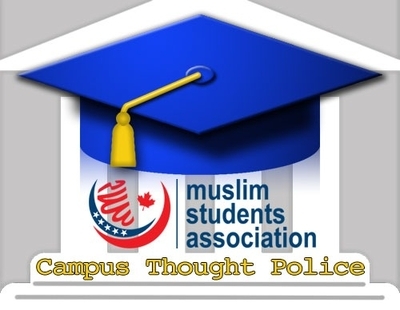 But student groups, often led by campus MSA chapters, take it upon themselves to decide what views others should be allowed to hear. In 2011, 10 people tied to the school's Muslim Student Union (MSU) were convicted on two misdemeanor charges after orchestrating a plan to shut down a University of California, Irvine speech by then-Israeli Ambassador Michael Oren. Emails obtained by the Investigative Project on Terrorism, and later admitted into evidence during the trial, show the MSU designed a "game plan" to shout down Oren's speech. "[O]ur goal should be that he knows that he cant (sic) just go to a campus and say whatever he wants," one of the emails said. Members were advised to "push the envelope," in order to "realize our role as the MSU of UCIrvine." The same student group at the same campus has repeatedly sponsored hate speech in outdoor centers of campus. Six months after the "Irvine 11" (one student was not brought to trial) were found guilty, the MSU presented a speech by Imam Abdul Malik Ali. In previous UC, Irvine speeches, Malik Ali said he supported Hamas, Hizballah and jihad and called Barack Obama a "deception" because several of his top advisers were Jews. In 2012, he derided what he saw as an American imperialism that is driven by racist power brokers and "Zionists." It's a horrendous double standard. The same groups trying to silence speeches by people they don't like engage in aggressive, in-your-face demonstrations in the heart of many college campuses, making it impossible for people to choose whether they want to hear the message. At the University of California, Berkeley, students were confronted by fake "checkpoints" during an annual "Israeli Apartheid Week" of protests. The checkpoints featured students carrying fake guns who hollered "Are you Jewish?" as they passed. One student was assaulted. But when Berkeley invited atheist comedian/talk show host Bill Maher to speak at its winter commencement in December, more than 6,000 people signed petitions urging the invitation be rescinded. Again, the exposure to ideas they may not like was seen as a threat by some student activists. "As the Student Regent for the University of California, I cannot stand for any action that makes our students feel unsafe, wrote Sahar Pirzada on the petition page. "Bill Maher should not be honored for his bigotry and sexism by being invited to be a speaker on our campus." "In a time where climate is a priority for all on campus, we cannot invite an individual who himself perpetuates a dangerous learning environment," wrote Sadia Saifuddin. "Bill Maher's public statements on various religions and cultures are offensive and his dangerous rhetoric has found its way into our campus communities. Too many students are marginalized by his remarks and if the University were to bring this individual as a commencement speaker they would not be supporting these historically marginalized communities." Dangerous rhetoric that will make students feel unsafe. Maher did speak. Plenty of people likely disagreed with some of his message, which focused on climate change and defended liberalism. No injuries were reported. Berkeley deserves credit for sticking with its choice. Brandeis University, named for a Supreme Court justice who defended free speech, withdrew a similar invitation to Ayaan Hirsi Ali. Here is what her protesters feared hearing. For the sake of argument, let's assume every horrible thing critics say about speakers like Nomani, Ayaan Hirsi Ali, Maher and others are absolutely right. They have their own constituencies. They're not going anywhere. How does it serve young people to shelter them from life's realities – one of which is that people out there will not always, or even often, agree with you – at the very place that is supposed to prepare them for life? The better lesson would be one that protects and defends a founding American principle – the right and value of free speech. How many heretics were burnt at stake not so long ago? The Ku Klux Klan is still alive. The battle against Islam isn't going to be any easier. "The urge to excise any sort of negative energy, thought, or feeling in and out of classrooms on campuses is widely and appallingly documented." Except for Muslims who are allowed to attack other students, shout them down, close down events, and to freely spread their evil messages without allowing others to debate them. Universities and lower schools who do this are advancing radical Islamic propaganda at the expense of the freedom of speech of other students.. Universities are places for debate, but have succombed to the easier tactic of silencing people they do not like. It is the obligation of all Muslims to implement Sharia law. Sharia law does not allow any criticism of Islam. The attempts to shut off discussion of Islam is nothing more than attempts to enforce Sharia law. American liberals and progressives would better serve their own agendas by reading the Koran. Unless of course they all want a little FGM and burka for their girls. WHAT'S THIS? "enabling Islamophobia," a contrived term used by radical Islamist groups, as Nomani noted in a January Washington Post column, to intimidate people out of discussing or criticizing radical Islam." NO! It was to intimidate people out of discussing or criticizing Islam -- standard Islam!